Joe Nimziki: I am a fan of the original Howling. The decision was made by all involved to create a new, original story for our movie…but I still tipped my hat to the original several times in our film. 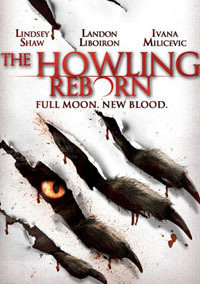 Some Howling fans may take umbrage with the fact that Reborn has the Howling moniker but plays more like a magnetic and captivating romance – any trepidation about using the Howling name? JN: I’m sure you’re right, but unfortunately there’s nothing I can do about that. It’s certainly a reboot and not a remake. Hopefully most people will consider our film on its own terms…and if the research screening and early reaction is any indication they will enjoy the movie regardless of any preconceived expectations. The attraction between Shaw and Landon Liboiron is key to what makes Reborn a success – was it something you had to work on and what in your opinion makes for memorable on-screen chemistry? JN: There was a lot of auditioning to find Lindsey and Landon – then a lot of rehearsal with them to find that relationship. The two of them also took it upon themselves to spend time together when they weren’t shooting which helped. I think they’re terrific together in the film. A lot is made about actors either having ‘chemistry’ or not, but I think that’s only part of the equation, along with a script that works and a lot of hard work. When everything comes together, like it seems to have done for us, it’s really fun to watch. What do you guys think? I know we have a lot of original Howling fans here, how do you feel about this new film and what Joe had to say?